It seems I always have a brush with blue paint on it behind my ear! This is my sultry look. I lost my favorite earrings, though. And yes, I have goat-pupils.\r\n\r\nMuch more furry-animal-person-type art soon! With snouts and wet black noses and floofy long tails and everything! \r\n\r\nAcrylics and watercolor pencil on cardstock, plus touched up in photoshop.\r\nCopyright Buzi. A picture of me! For my commission ads, when I have them up. 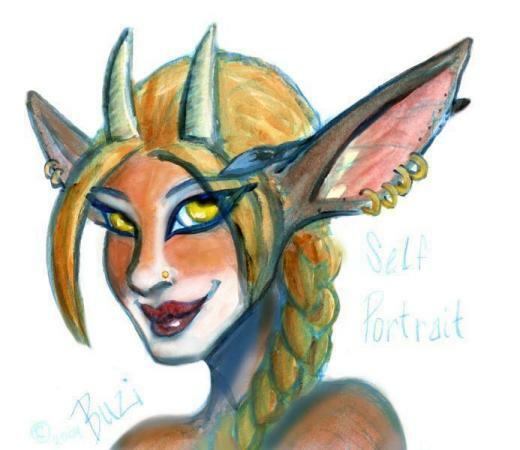 Done in acrylics and scanned into photoshop.\r\n\r\nMy name's Buzi, short for Mbuzi, which is "goat" in Swahili.\r\n\r\nArt and character design copyright Buzi.